Last Thursday, the younger stidkid was promoted from his school. Next year, on to bigger and even better adventures, one hopes. 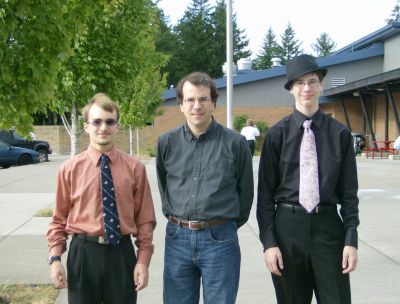 Here is a pic of my three menfolk, of whom I am (I think) justifiably proud. Each has qualities that are rare and wonderful, and I love them so much. My cup runneth over. Today, Father’s day, I celebrate the fellow in the middle, who is steady and patient, and a wonderful father. Well. It was a LONG school year for me. And now it is over. I am apparently continuing in the program, and have a student teaching assignment lined up for next year! I will meet with my mentor teacher next week. The end result of the actual teaching in the school I was doing my practicum was positive. Not only did we all survive (always my first concern), but more than 95% of the students managed to turn in work that demonstrated an engagement with and understanding of the idea of adding description to writing to enhance meaning! A few students even chose to continue to refine their work after I returned it to them. Most students seemed to find either poetry OR prose engaging, but a few enjoyed the whole shebang. I was able to demonstrate improvement in writing for many students, although in the future I need to refine the actual points I document. The best parts of this school year were definitely the work I did IN the actual classrooms; the hardest and least satisfying were the “lessons” I had to write up and “teach” to my peers — who don’t interact with materials at the same level of interest or ability as real children. Also, most of those lessons provided anywhere from minimal “good job” feedback to none at all from my instructors. What is the point of assigning work that isn’t monitored, and letting students continue blindly in a path that may or may not be profitable? At least now I know from a student’s point of view how that feels (not good). I have a couple weeks now to relax and recoup before I begin the summer session — five weeks, but devoted to the reading endorsement that so interests me. So it won’t seem onerous. And it’s with the same teacher I had last summer, someone who is engaging and gives good feedback. The “free time” I will have will be devoted to the garden and house, and to working with a stidkid on refining some skills that his school has (again) dropped the ball on. *stern mama look* No excuse to let a student’s performance not meet their ability! And in August, just before I dive into the student teaching, there is a Babblers meet up here in Olympia! We are very excited about this. Will get some folks from the local area as well as some from as far afield as Canada and the East Coast of the U.S.! For today, however… I am resting and getting over a late flu bug that hit this week (yes, I missed my final day of class for the program), and getting my bearings on the tasks ahead for the summer. If the sun comes out, I might even spend time in the garden!